POSBay Pty Ltd offers Zebra S4M 203 DPI industrial label printers featuring thermal transfer or direct thermal label printing capabilities. Offering a resolution of 203 DPI, Zebra S4M industrial label printers can print up to 2,500 labels per day, delivering good value for money. This model is designed for the budget-minded with features that support many applications at an affordable price. The easy controls and proven side-loading design allow simple operation, enabling operators to focus on more productive tasks. 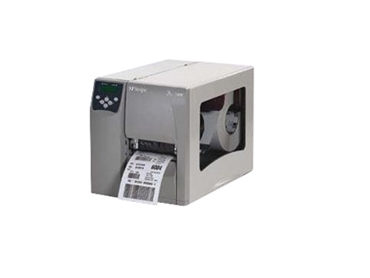 Zebra's S4M thermal label printers offer ease of use, metal construction and a variety of connectivity options with the ability to take a full 8" roll of Zebra labels for fewer media changes. Zebra S4M industrial label printers offer standard serial, parallel and USB connectivity, as well as optional internal 10/100 Ethernet and IEEE 802.11b/g wireless networking for simple integration and remote monitoring. The printer can be ordered with different printer programming languages.